Well, hey there Taco Tuesday! And Cinco De Mayo! And Foodie Tuesday! (…if you remember it from when I used to be good about blogging consistently…) In celebration of this explosion of special occasions today, I thought I would share a super quick tip with you. 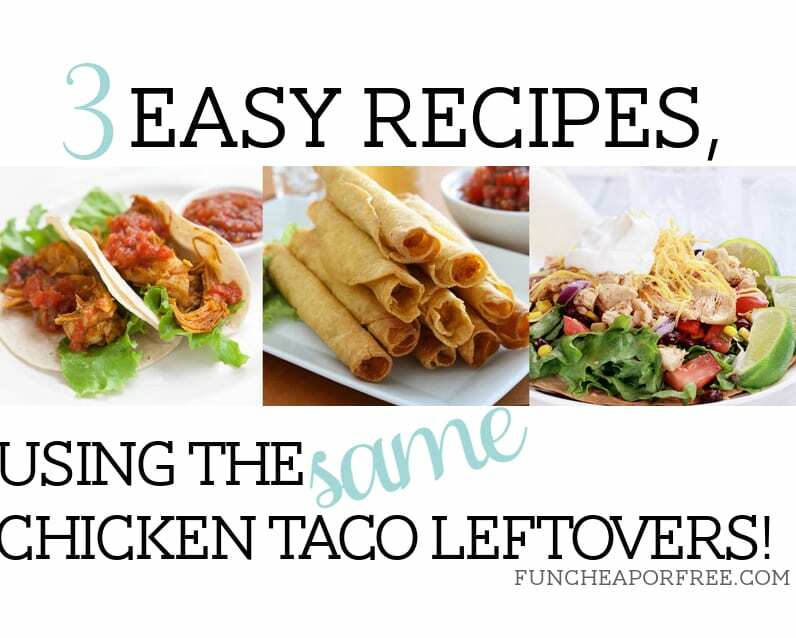 These are 3 of my favorite BEYOND EASY recipes, all using the same chicken taco leftovers. I'm calling it Taco Twosday…because it's just that awesome. If you are throwing out leftovers, you might as well be tossing dollars straight in the trash. With a little creativity and a few alternate ingredients, you really can repurpose those leftovers that you would otherwise be sick of eating! Place chicken in a greased slow cooker. Mix together salsa, black beans, corn, and taco seasoning. Pour over chicken. Cook on low 5 hours or until chicken is fully cooked. 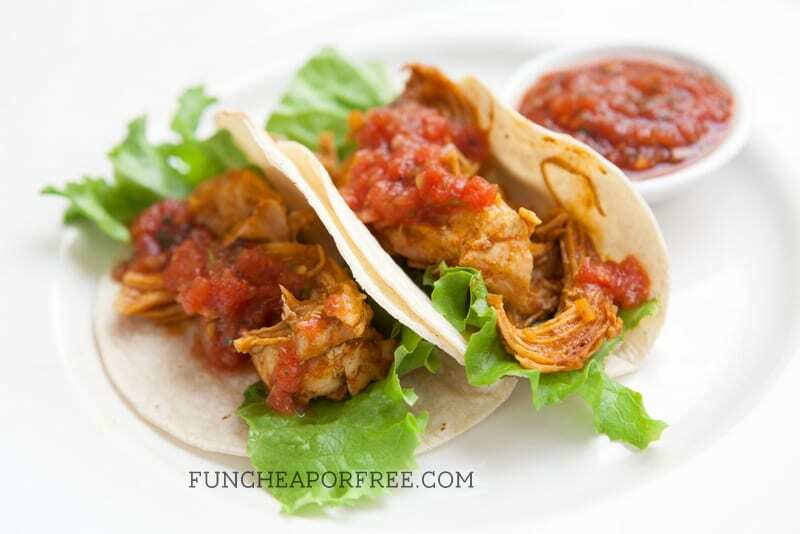 Shred chicken with 2 forks, then place back in slow cooker for another 30-60 minutes to simmer in the juices. 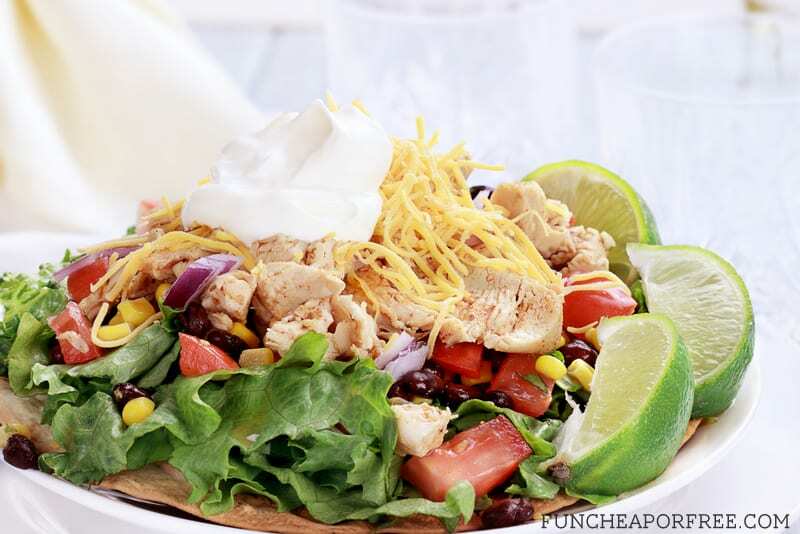 Serve on flour tortillas and top with your favorite taco toppings! Warm package of tortillas in the microwave for 20 seconds so they don’t rip when handling them. Put a line of shredded cheese in the center of the tortilla. 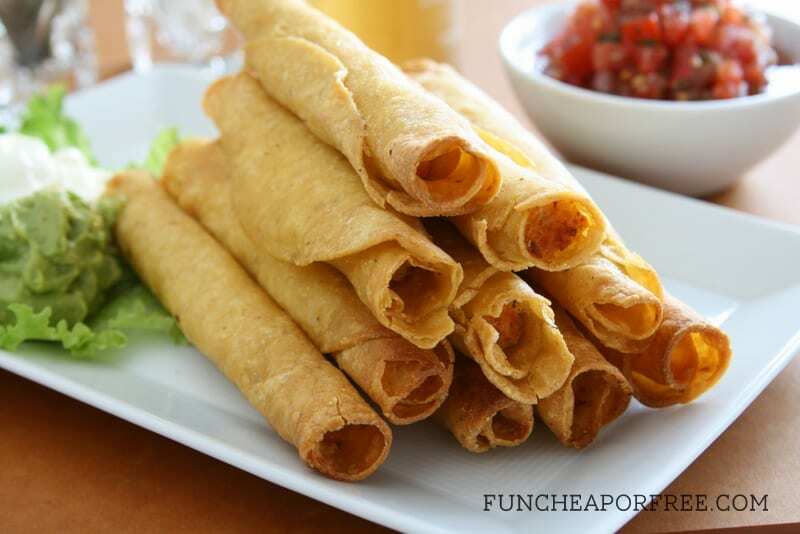 Top cheese with desired amount of chicken filling. Roll up the tortilla, place seam-side down on a cooking sheet. Spray tops with cooking spray. Bake on low broil for a few minutes until slightly browned and crispy. Watch carefully so they don’t burn!!!!! It will only take a minute or two for them to brown. Dip in a mixture of ½ salsa, ½ ranch. Create a salad of desired fresh ingredients. Heat chicken filling in the microwave, top salad with chicken. Drizzle salsa/ranch dressing from day 2, or create cilantro lime dressing (take the cilantro lime chicken recipe and blend it with enough ranch dressing to get your desired consistency). Get a printable version of the recipes from the video HERE. What are YOUR favorite recipes/leftovers to repurpose? Share them HERE to use in our Freebs cook book! Also, check out my other recipes, and be sure to subscribe to my Youtube channel for lots of quick savings tips like this! I love all of these ideas! I am new to your blog and deals to meals and did my first price match trip to walmart yesterday… the checker was super upset about me trying to price match and was going on and on in very broken english about their policy that has evidently changed and was kind of acting like I was criminal for attempting to price match. I did what you suggested in past posts and acted confident and kind but assertive and she gave in a little but was very very put out… were there some major changes recently? This seemed like it was more than just a grumpy cashier, but since it was my first time im not sure- Im too scared to try it again though!!! Loved your ideas and video. Cute kids! I will give it a try. Thank you.